Le volume Textes de mathématiques pures (1745-1752) contient des textes de recherche de d'Alembert écrits dans les années 1740 et 1750, après son entrée à l'Académie des sciences de Paris. Les thèmes traités portent principalement sur le calcul intégral (intégration des fonctions algébriques à une variable, rationnelles ou irrationnelles, intégration des équations et des systèmes d'équations différentielles ordinaires), mais on y trouve aussi sa théorie des nombres complexes, notamment le théorème fondamental de l'algèbre, et sa conception de l'extension des logarithmes à des nombres qui ne sont pas réels positifs. Sur ces thèmes, d'Alembert n'a pas publié d'ouvrage de synthèse et plusieurs de ses écrits sont restés inédits. L'édition de ces textes en un même volume fait apparaître l'ampleur et la cohérence des travaux de mathématiques pures de l'encyclopédiste, souvent sous-estimés dans l'historiographie, et permet ainsi de mieux appréhender sa pensée mathématique dans toute sa complexité. C. Gilain, Ed. : uvres complètes de Jean Le Rond d'Alembert. 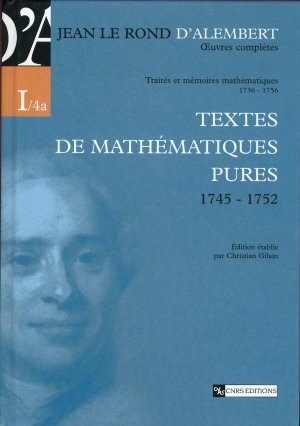 Textes de mathématiques pures 1745-1752, CNRS Editions, Paris, 2007, 436 pp., EUR 60, ISBN 978-2-271-06013-3. This book contains d'Alembert's mathematical texts on pure mathematics written between 1740 and 1752, when he was one of the most important members of the Academy of Sciences in Par¬is. The book is the fourth volume of the first series of the critical edition of d'Alembert's collected papers prepared by a group of mathematicians, historians of sciences and philosophera (directed by Christian Gilain, a specialist in the history of mathema tical analysis and a professor at Université Pierre et Marie Curie, Paris). The book starts with a comprehensive introduction, where d'Alembert's ma thematical ideas, works and results are presented and their rote in the development of mathematics is analysed. The next part contains three texts with the title "Recherches sur le calcul intégral" (1745, 1746, 1747) containing d'Alembert's fundamental contributions to integral calculus (e.g. integration of algebraic functions of a real variable, integration of rational and irrational functions, the Riccati equation and its solution, the d'Alembert equation and its singular solutions, rectification of ellipse and hyperbola, methods for solution of some systems of differential equations) together with many notes and remarks. The paper "Observation sur quelques mémoires imprimés dans le volume de l'Academie 1749" (1752) contains d'Alembert's theory of complex numbers and his contributions to the fundamental theorem of algebra, which were inspired by Euler's works. The fifth text "Sur les logarithmes des quantités négatives" (1752) shows d'Alembert's concept of the logarithm of negative, and complex, numbers. The sixth of d'Alembert's published articles "Additions aux recherches sur le calcul intégral" (1752) contains some cor¬rections and an extension of his text on integral calculus from 1747. This volume continues filling in the complete works of Jean Le Rond d'Alembert by adding texts in pure mathematics written between 1745 and 1750. Four of the six texts are versions or parts of a major work on the integral calculus and were published be¬tween 1745 and 1752. These concern the integration of rational or irrational differential expressions of one variable and integration of ordinary differential equations including systems thereof. Two are manuscripts unpublished in d'Alembert's lifetime that are concerned with topics prompted by several memoirs of Euler including the fundamental theorem of algebra and the extension of logarithms to negative numbers. The principal editor, C. Gilain, provides an extensive 100-page introduction giving the main themes of each part and its historical context. The case is made that this is a particularly creative period for d'Alembert with many researches leading to later publications. In continuing the high standards of the edition, the editors adhere closely to the original notation and only depart from it mainly for the sake of consistency. Publisher's description (translated from the French): "The works of Jean Le Rond d'Alembert (1717-1783) cover a wide spectrum of knowledge: mathematical science, music, literature, phi¬losophy. Through his academic activities, his participation in the Encyclopédie and his involvement in the intellectual life of his time, he left a distinct mark on the ideas and the legacy of the Enlight¬enment. This critical edition of his complete works, the first to date, was prepared by a group of historians of science, philosophera and scientiste. "The present volume contains works of d'Alembert written between 1740 and 1750, after he joined the Académie des Sciences de Paris. The topics treated concern mainly integral calculus (integration of algebraic functions of one variable, rational or irrational, integration of ordinary differential equations and systems of equations), but they also cover his theory of complex num¬bers, especially the fundamental theorem of algebra, and his ideas about extending logarithms to numbers that are not real positive. D'Alembert did not publish a work of synthesis on these top¬ics, and some of his works remained unpublished. The presentation of these writings in a single volume helps to highlight the breadth and coherence of this Encyclopedist's works in pure mathe¬matics, works that have been underestimated in historiography, and thus makes it possible to have a better grasp of his mathematical thought in all its complexity."